ScreenRecycler enables you to use a second machine as an additional – if slightly laggy – display. A unique and well executed idea, but it needs a fast network to be truly usable. Been using Macs for a while? Then you're likely to have a spare machine or two kicking around. Due to the durability of most Macs, chances are they'll be in working order, too; just not powerful enough to meet the demands of modern apps. With ScreenRecycler, old Macs with a screen can once again prove useful. Via some cunning trickery based around Virtual Network Computing, ScreenRecycler enables you to use a spare Mac's display (or that of a PC with a suitably installed VNC client) as an additional display for your main Mac - and for the fraction of the price of buying a second monitor. 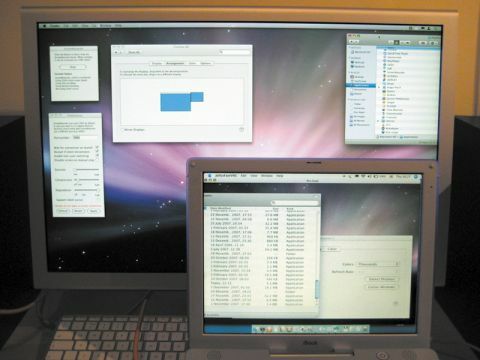 We found the set-up process painless: the bundled VNC client - JollysFastVNC - was installed on a 'retired' iBook, while ScreenRecycler itself (and its driver) was installed on a MacPro. One restart later for the MacPro and we were up and running, the iBook's screen extending the desktop of the MacPro's monitor. With any system that relies on networking, there are caveats. On wireless, we found ScreenRecycler sluggish, even after reducing the size and number of colours of the 'virtual' display. However, on Ethernet, the additional display's update was almost sufficient to watch a DVD, and certainly suitable for housing iTunes or palettes from the likes of Photoshop. With Apple's introduction of Spaces in Leopard, ScreenRecycler is perhaps more of a niche concern than it once was, but it remains useful for users who need more space than their primary display allows and who have working computers with screens sitting idle. And it's cheaper than buying another monitor.